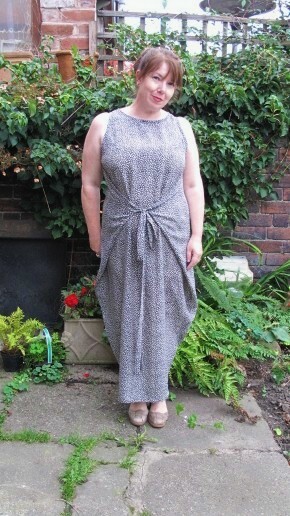 My first project of the new year was the Named Tuuli V-neck jersey dress. 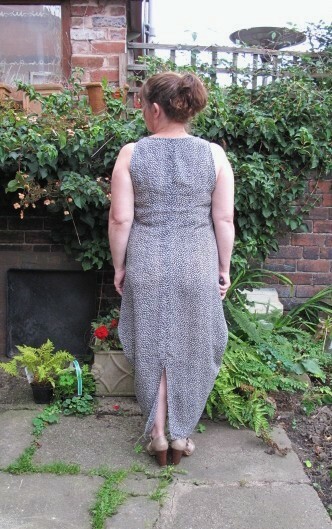 I love knit dresses, I can simultaneously look fairly pulled together whilst feeling happily comfortable (like wearing secret pyjamas) I’ve made a few knit dresses over the past few years but the V-neck and pleated skirt offered something new and appealing. 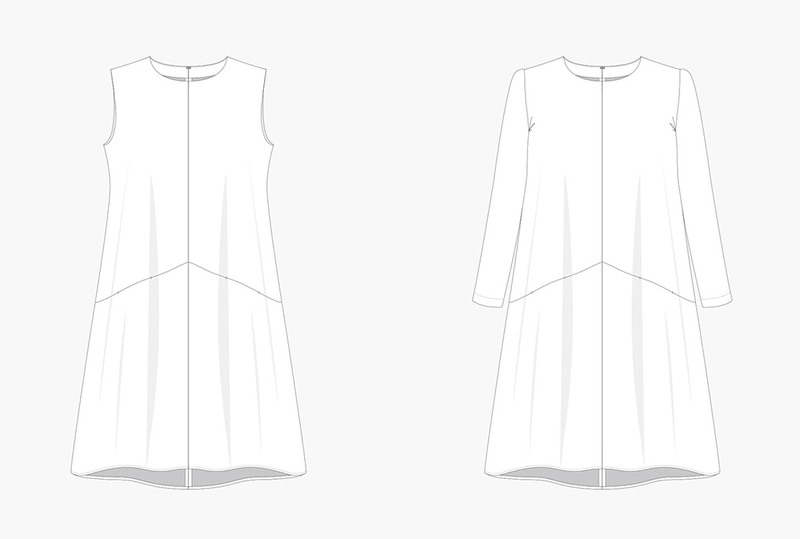 As with a number of Named patterns it includes a second pattern which with the Tuuli is a bodysuit. 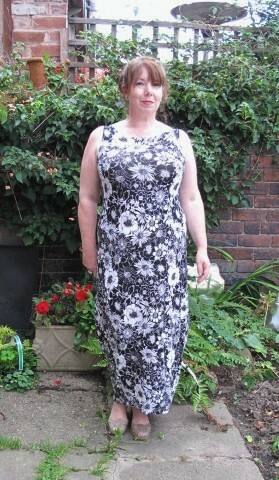 The fabric is Liberty Dufour Viscose jersey I bought from ebay. I’ve done a bit of sleuthing into this and found that it’s probably over stock from a ‘special edition liberty’ ready to wear dress. From experience, Liberty jersey is worth paying that bit extra. It washes and wears incredibly well and is a delight to work with. The Dufour is a viscose knit which has a fair bit of weight to it and lots of drape. 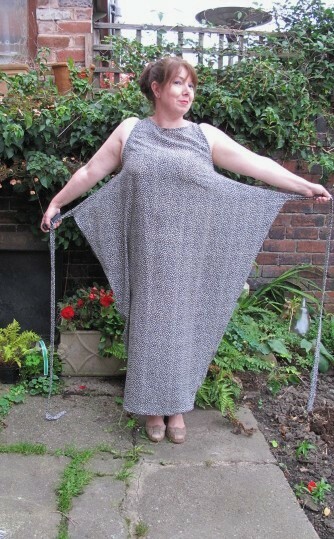 I’ve also used the Clarendon, a cotton knit which has a bit more body about it. The fabric requirements for the dress give 260cm but with a bit of careful cutting (and shortening the sleeves by 5 inches and the hem by 3 inches) I managed to fit it all on. One thing to note is that due to the skirt width it really needs a wide fabric, at least 130 cm. I cut a size 46 which was nearest to my measurements. There’s quite a good size range going from a 32 (30-24-33) to a 50 (46-40-49). 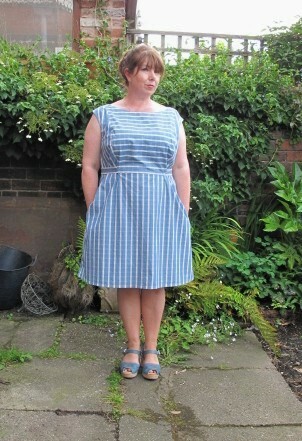 There’s a bit of negative ease in the pattern, around four inches over the bust and a couple of inches at the waist. 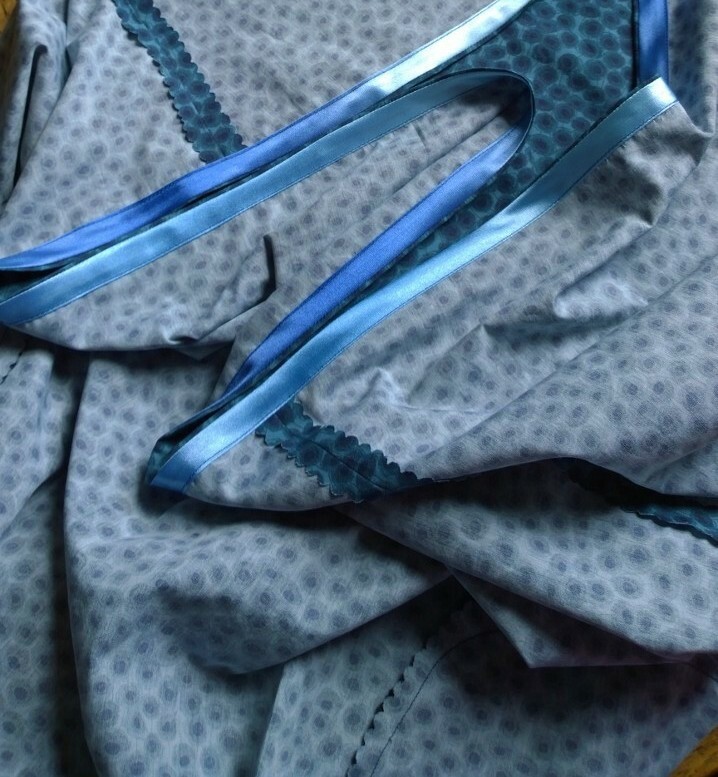 There’s a good reason for the skirt pattern piece needing to be overlapped, it is HUGE, there’s 2.5 metres of fabric in the skirt which all needs to be pleated. 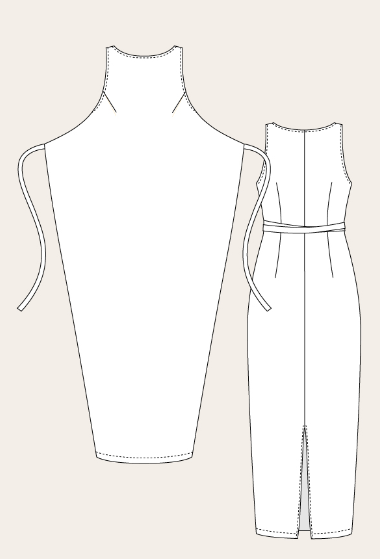 The front of the bodice is cut in two pieces which are joined at the centre front below the neckline. 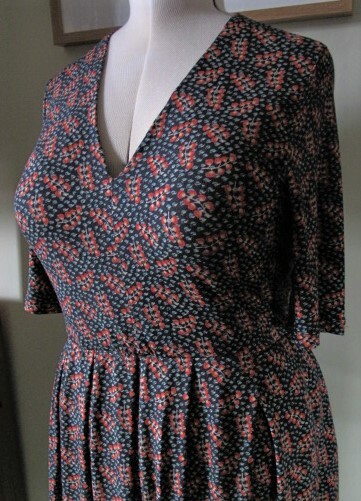 The neckline is finished with a facing which extends down to the waist. The facing is then secured by topstitching which adds quite a neat design detail, this would be much more noticeable if sewn in a plain fabric, as mine is so busy you can’t really see it. 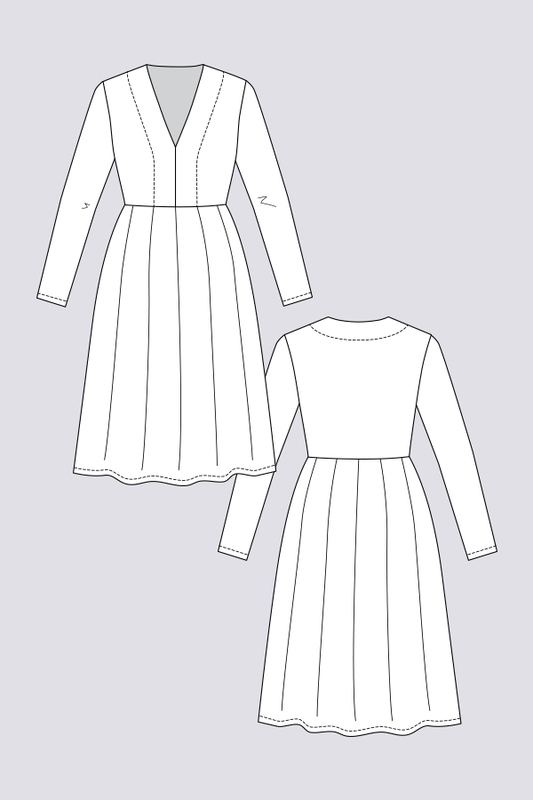 The instructions call for using knit interfacing on the facing. As I didn’t have any and my local haberdashery didn’t know where I could get some I experimented with what I had. 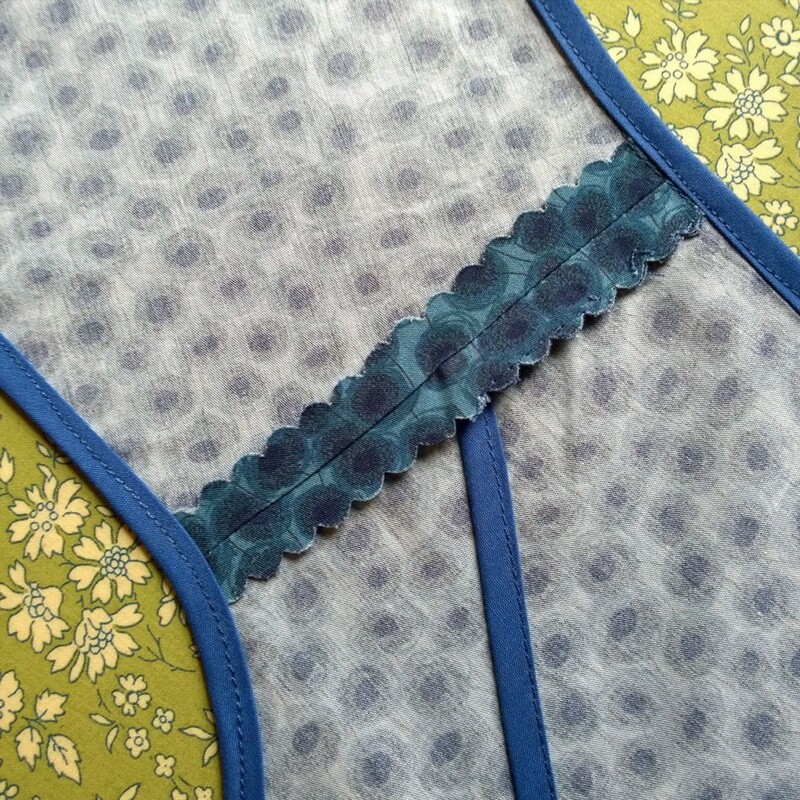 I found that when cut on the bias Vilene Superlight interfacing had a bit of stretch so I went with that. As it is there’s not really that much stress around the neckline to worry too much about this. The opening is big enough to get your head through without stretching it out and as the facing is stitched down there isn’t going to be much stretching there. I was a little apprehensive about all the pleating but after taking my time, and using lots of pins, it all lined up perfectly without the need to do any fudging. I basted the pleats in place but also kept them pinned below to make it easier to work with. I added in seam pockets to the skirt, which wasn’t in the instructions but I have a mission to put pockets in everything. This time however I don’t think it worked out. 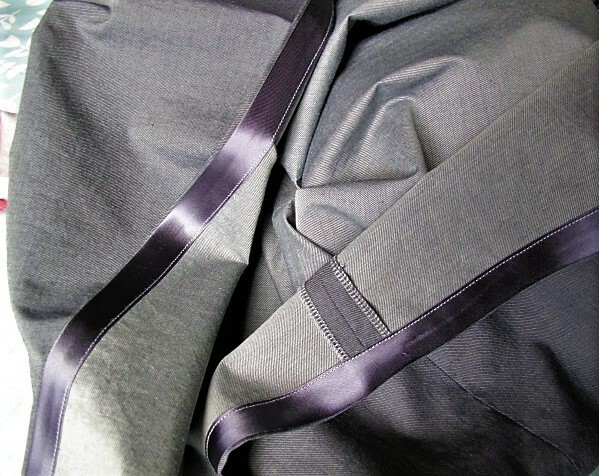 The pockets are hidden in the pleats but the bulk of them affects the fall of the pleats. They also don’t fall on the sides, one is a few inches towards the front and the other a few inches towards the back so they are quite difficult to find when you are wearing it! There was a lot of weight in the skirt and I doubted the bodices ability to hold it up so I stabalised the waist with some clear elastic. I stretched out a length three quarters the size of my waist. This made a world of difference as it sits well without any pulling. Attaching the bodice was straightforward, I finished the waist seam with my overlocker but because of the pleats it was a little bulky (there’s four layers of fabric in there) I don’t think there’s a way to overcome this though. Finally, I finished the hem and sleeves with a twin needle. 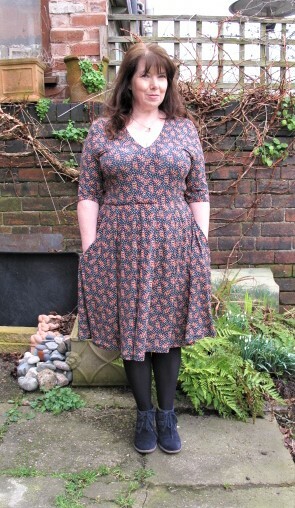 I am incredibly pleased with the finished dress. 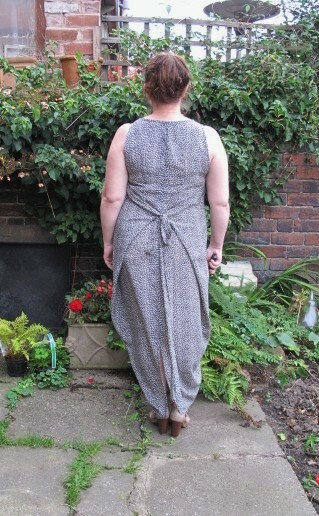 The fabric works perfectly, the weight really makes the pleats hang lovely (although in the pictures I’d been wearing it all day so there is a bit of crumpling going on) I enjoyed making it, the pattern is incredibly well drafted and everything fits together perfectly. 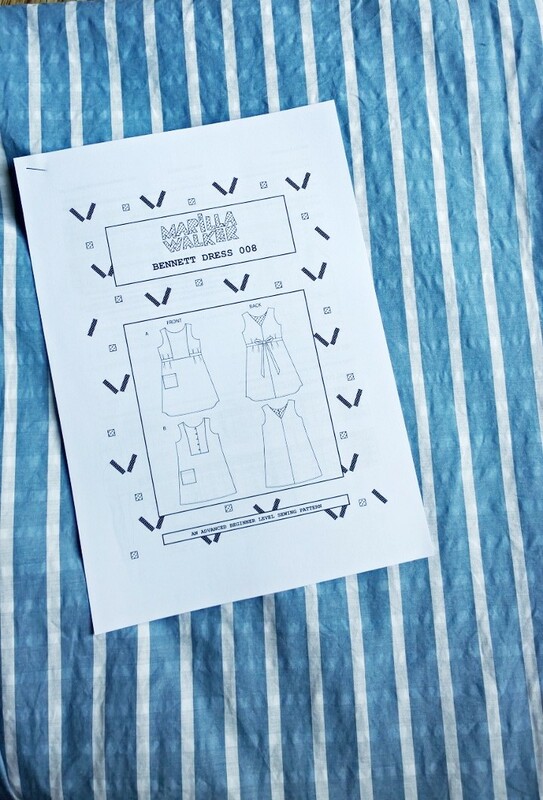 I’ve come to realise this is a very important criteria when choosing patterns, sewing time is so precious that I really don’t need the hassle and headache of fudging a pattern which doesn’t quite meet up as it should. 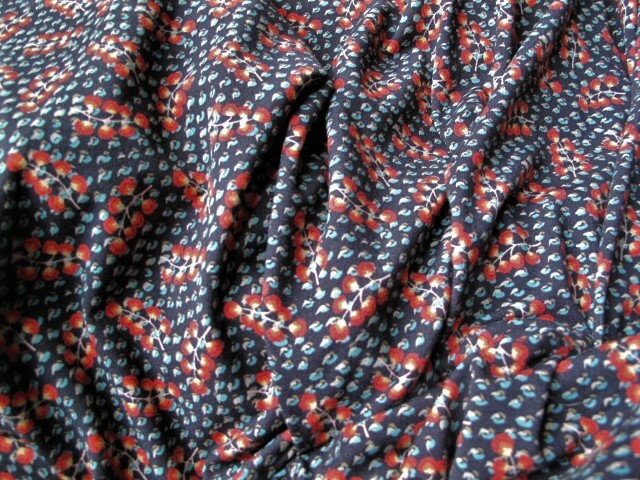 The fabric is a cotton poplin, yet more from my Fabworks bundle win. One of the great things I remembered about the Belladone was being able to squeeze it out of a metre and a half of fabric. I think I may have cut the smallest size along the hem, just a lazy way of shortening the skirt! This time I made a muslin of the bodice before cutting into the good stuff and all my tweaks seemed to have worked. 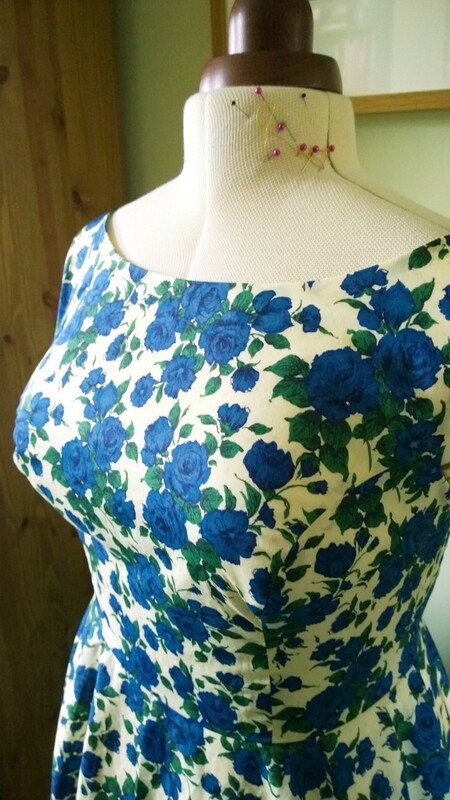 I cheated a bit and cut the whole dress out with my scalloped pinking shears (from eBay, search ‘scalloped pinking scissors’) Finishing the seams before sewing saves so much time! 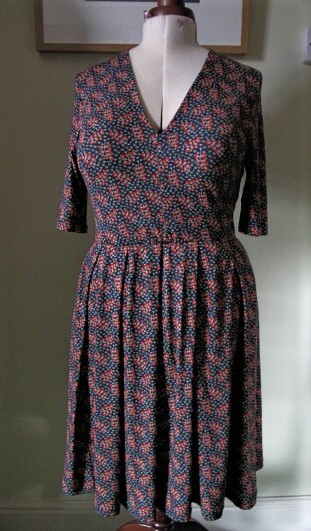 As with all Deer and Doe patterns the dress came together surprisingly quickly. I must admit to being a bit of a Deer and Doe fangirl, their patterns have some lovely design features and the drafting is very good. 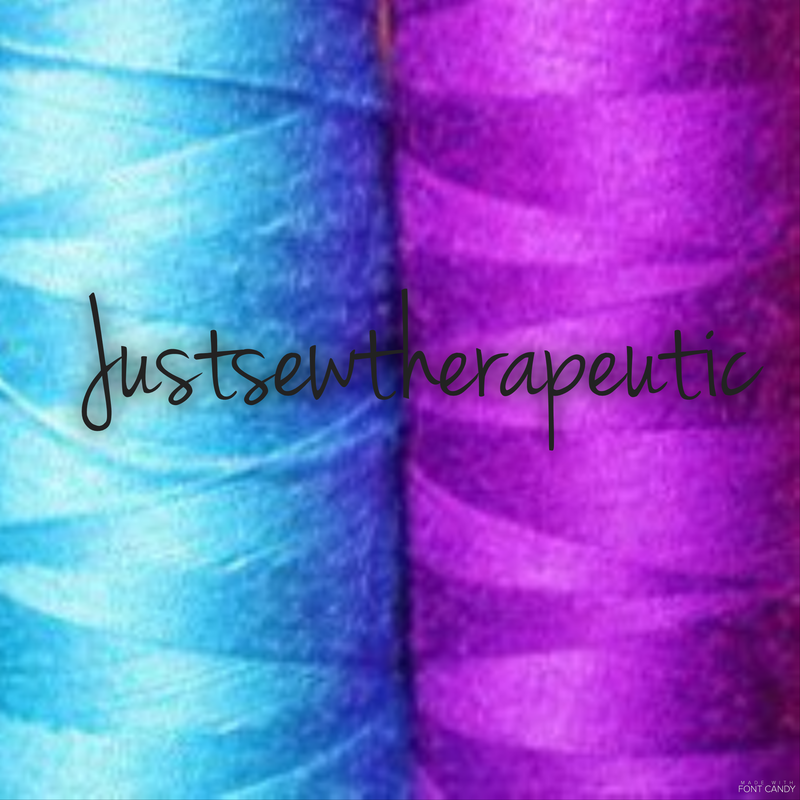 I’ve never had a bad experience and they are always a dream to sew. 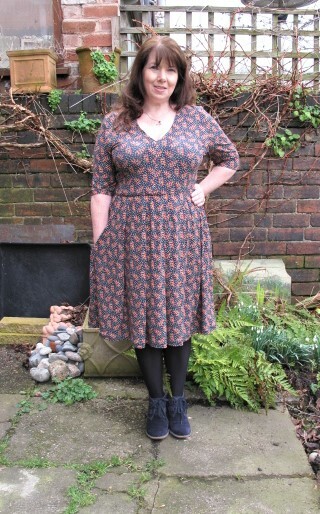 I’m incredibly pleased with the finished dress, the fit is very nearly there. I think for my next one I could add an extra inch to the full bust adjustment. There’s also some pulling on the back so I’ll try cutting a 46 next. I really love the skirt though, it’s very similar to the tweaked Peony I have used before, technically an A-line but not so sticky outy as some patterns. 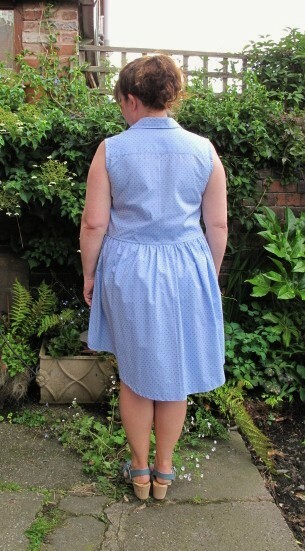 I also love the little pleats at the waist and would like to use that part of the pattern for some Autumn skirts. Speaking of Autumn I can’t believe it’s September already! I should be able to get more wear out of the Belladone as I can wear it with tights and a cardigan (and possible a long sleeved top underneath for extra warmth) I’ve got a very autumny length of fabric in the stash that I bought specifically to make a cold weather Belladone (it’s a sort of bronzey brown with dark red flowers on it) hopefully I can fit it in while it’s still seasonally appropriate! I’m actually looking forward to getting back into the old routine, I haven’t had as much time to sew as I’d have liked over the summer. The nights drawing in doesn’t seem so bad when I get a bit more time to sew in the evenings. The prospect of having to put all my summer clothes away ‘til next year is a bit sad, but then getting the winter ones out is quite exciting as there’s always things I’d forgotten I had! I’ve also just got a stash of winter fabric down from the loft, again there were things I’d forgotten about so it was like going fabric shopping for free! 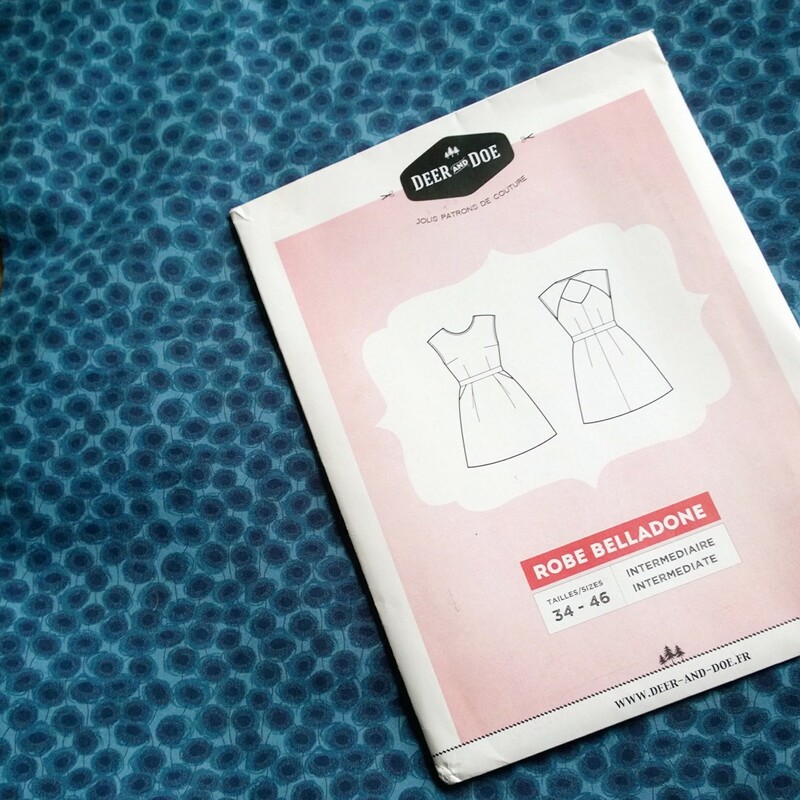 While we’re on the topic of fabric shopping I’m off to SewBrum again on the 24th September, this time I’m going to make a concerted effort to restrain myself and focus on finding things I need (yeah right!) I’ll be taking a couple of extra bags though, just in case I ‘need’ more than I think I do! 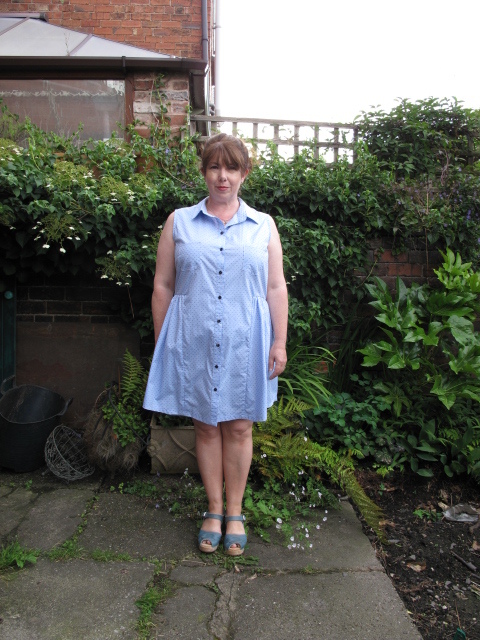 The next instalment of my sleeveless summer dress sewing is the Grainline Alder Shirtdress. 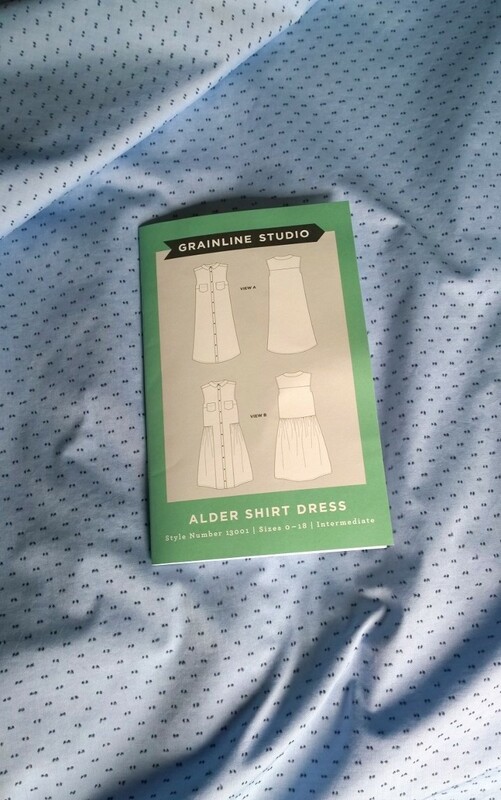 I’ve sewn many Grainline patterns but I was a bit on the fence when the Alder was released. I think it was the line drawing that deterred me, the illustration looks like it was drafted for someone tall and willowy and I struggled to see whether this would work for me (being the polar opposite of tall and willowy) The dropped waist also had the potential to hit at an unflattering level, possibly adding unwanted bulk to the hips. It’s been out for nearly a year now and the many lovely versions I’ve seen online have swayed my initial apprehension. 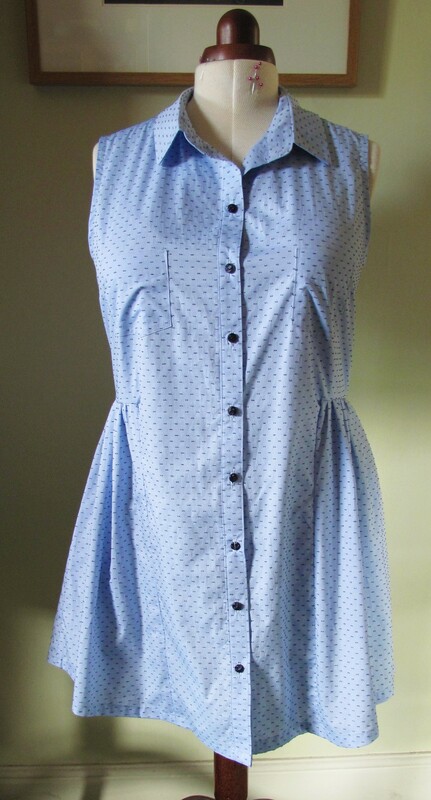 I had a sleeveless shirtdress hole in my wardrobe so I thought I’d give it a chance to fill it. 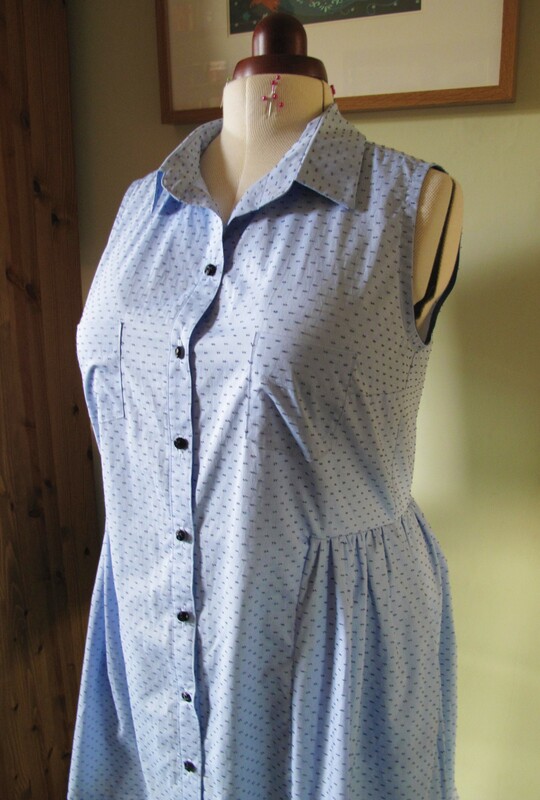 I used more of my Fabworks Mill fabric, this time a Swiss dot shirting. Mine is light blue with a navy dot which they don’t seem to have anymore but there’s blue with a grey dot still available. 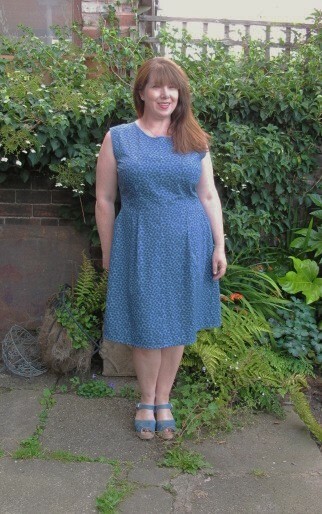 I went for view B with the gathered skirt, cutting a size 16 which matched my measurements exactly (42-35-42) but I cut the length to a size 0 (too lazy to use the lengthen/shorten line!) I think I used just over 2 meters of fabric. After measuring the bodice I was surprised to find it wasn’t as long as the illustration suggests so I only shortened it by an inch. The construction is pretty much the same as the Archer shirt to start off. I used Jen’s Burrito method for attaching the yoke and Andrea’s (amazingly easy) method for attaching the stand and collar. I finished the armholes with some readymade 13mm bias binding. I bought it from Plush Addict and I’m really impressed, it’s soft and malleable but sturdy enough to hold the shape of the finished openings. I also added in seam pockets along with the patch pockets on the bust, I really need somewhere to put my hands! 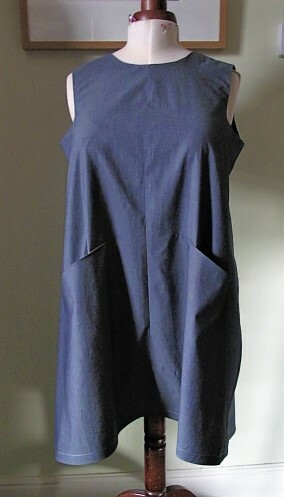 I was a little unsure about the high low hem but as I’d shortened the skirt when cutting had to go with it. The hem is very shirt like, raising up from the front (quite significantly) at the sides before dipping down at the back (which isn’t shown on the envelope) To finish it off (and following an Instagram referendum) I went with some navy Czech glass buttons which I think I bought from eBay. 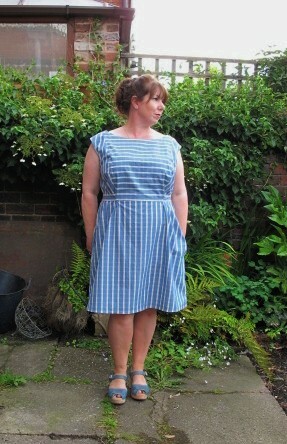 I’m pleasantly surprised by the finished dress and I think it may have tamed my prejudice of hi-lo hems. 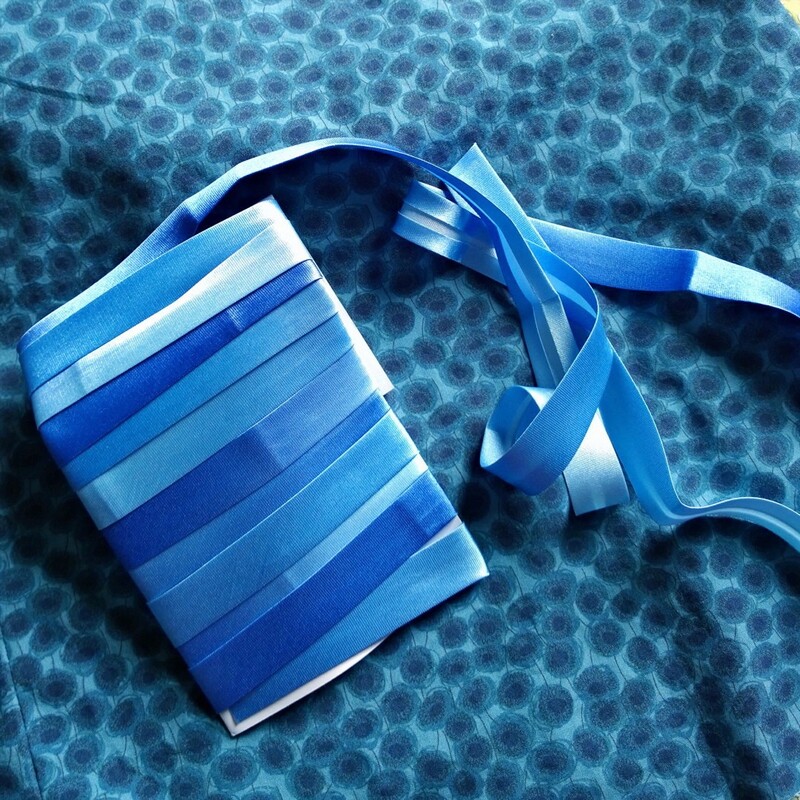 It was enjoyable to sew and everything fitted together nicely. The finished measurements are given on the pattern and they were true to the finished garment. If anything I could maybe have done with an inch or two of a full bust adjustment. The proof of the pudding is wearability and it has been getting a fair bit of wear, perfect for sunny days when you need something light that allows the air to circulate! 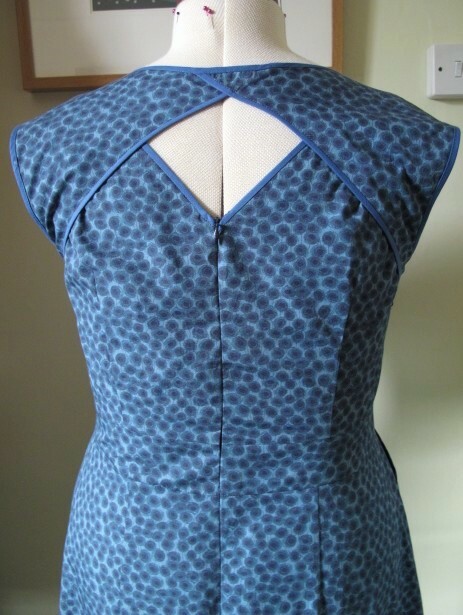 The sew along provides variations for a Mandarin collar, V neck and the option to add sleeves by combining it with the Archer so plenty of opportunity to play around with it. 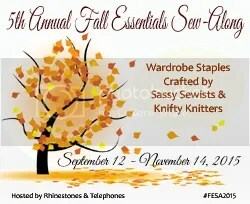 I think I need to be looking towards fabrics for the cooler weather though, maybe something I can wear through early Autumn and then layer up with a long sleeved tee and cardigan. I spent the whole of last Sunday logging my main stash (I’ve not ventured into the loft or bathroom cupboard yet) and so far I am up to 147 metres. It’s free to try for the first five fabrics and £4.49 for the full version (I must state I have no affiliation with the maker, I just think it’s brilliant!) The only problem I have is the urge to buy more fabric just so I have something new to add, like the fabric equivalent of Pokemon Go. I’m desperate to catch some Double Gauze for a Deer and Doe Datura but Cora tells me I already have 37 metres of suitable fabric! Now the wedding is over I’m starting to get back into a routine. I’ve managed to squeeze in a few hours sewing time throughout the week and I’m pleased to say these hours have been very productive (and incredibly enjoyable). 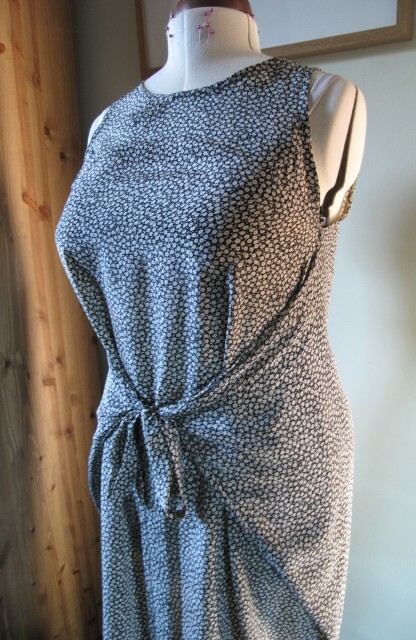 Since getting back I’ve been on a mission to sew some sleeveless dresses. 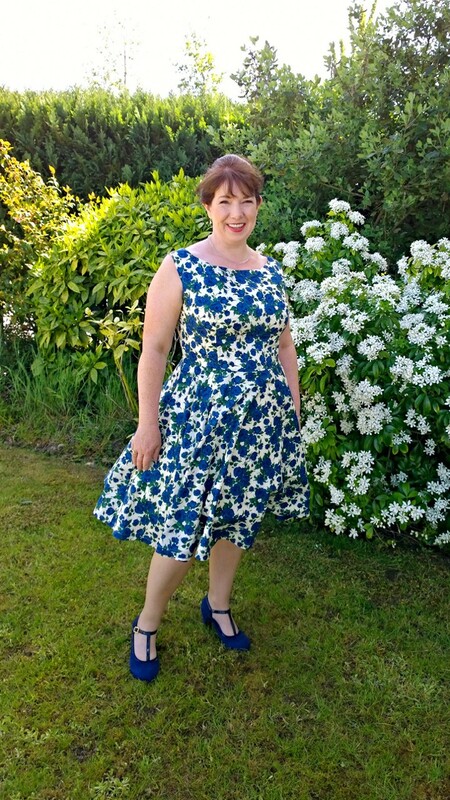 This was the one big hole in my wardrobe highlighted by Me Made May, the weather was glorious while we were at the Lakes and my one solitary sleeveless number was my Southport dress. 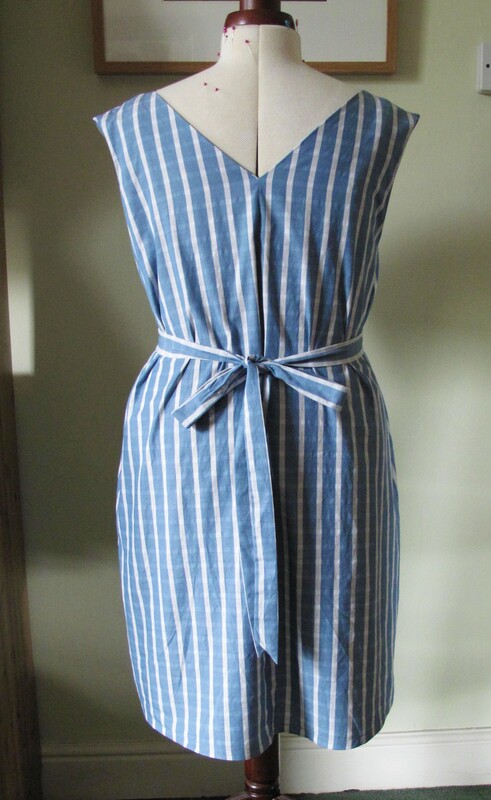 I was attracted to the loose silhouette and the ability to loosen the ties (which is the main thing I like about the Southport dress) One of the Sample garments Marilla made used a stripy fabric which contrasted the direction of the stripes on the bib section. I decided to blatantly copy her. 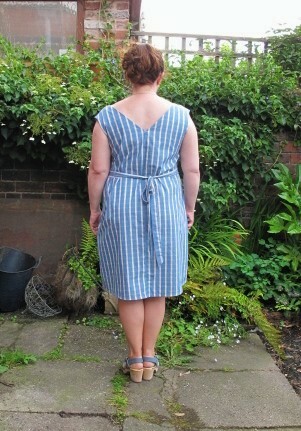 The fabric was from my Fabworks Millshop giveaway, a denim blue stripe check cotton, available here. The finished garment measurements are stated instead of arbitrary sizing, I wish every pattern company did this as I find it so much easier to choose a size. The sizing is quite broad, going up to a 52 inch bust, 54 inch waist and 59inch hip. From the given measurements I cut a size 41 inch shoulders and high bust before blending to a 43 through the bust (adding 2 inches) and then blending back into a size 42/47 for the waist and hips. 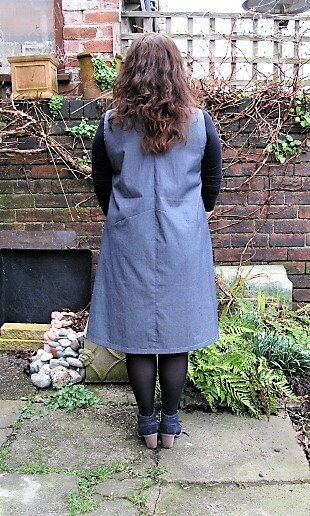 I chose view A with the straight hemmed skirt of view B. It all came together very easily, I did make a couple of errors due to my slapdash approach at the time. I forgot to interface the facings, only realising as I had finished the dress. This hasn’t been a problem though as the fabric has enough body to hold their shape. I also ignored the instruction to baste the bib in place before sewing, which led to having an extra centimetre of width and some sheepish unpicking. I made a couple of changes, swapping the patch pocket for in seam ones. I shortened the bodice by an inch as a standard adjustment for being short waisted. I also raised the armscye an inch as I found it a little too low on me, so it may be worth checking before cutting if you are on the short side too. I think next time I will also size down a bit for a more fitted look in the bodice. 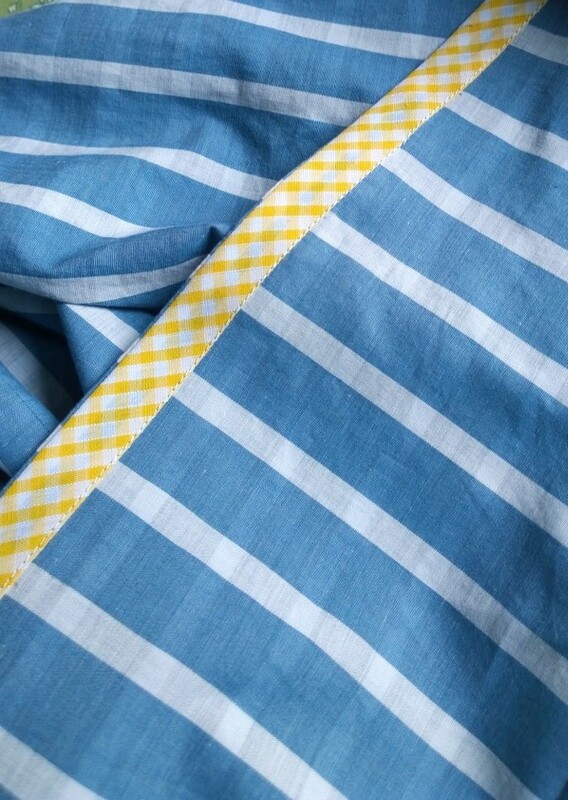 I bound the hem with some yellow gingham bias binding. 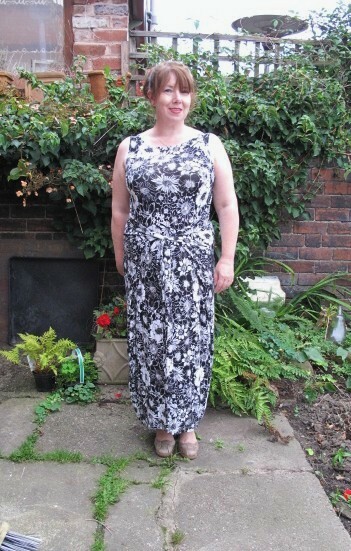 I’ve worn this dress a lot, although mostly with a cardigan (the Sun seems to have disappeared since embarking on my summer dress sewing extravaganza). 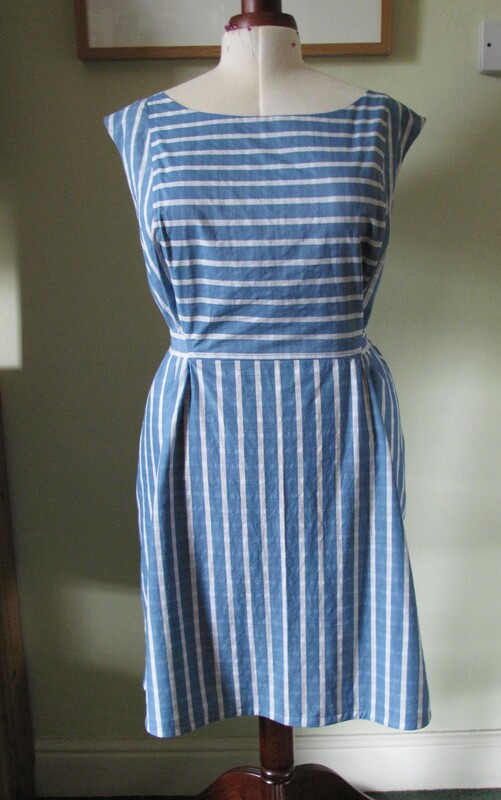 I like the nautical feel and the effect of the stripe direction which gives the impression of little capped sleeves. 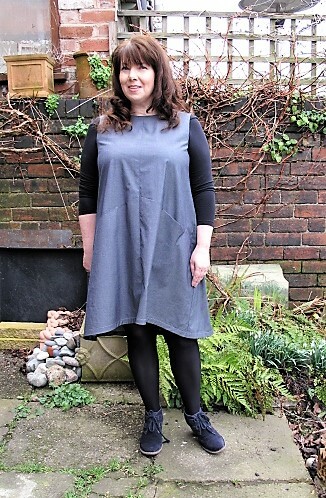 The fabric is wonderful, it doesn’t crease too badly so I can wear it all day and still look presentable if I get chance to escape for a quick pint in the pub in the evening. 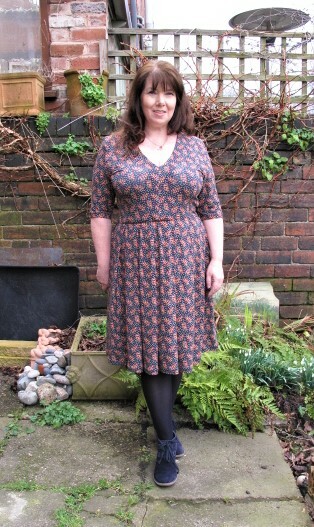 I’m pondering about using the pattern for the colder months, I think it would work well in a lightweight wool paired with tights and a long sleeved tee underneath, but I really shouldn’t be thinking about winter sewing plans, we’ve not had Summer yet! 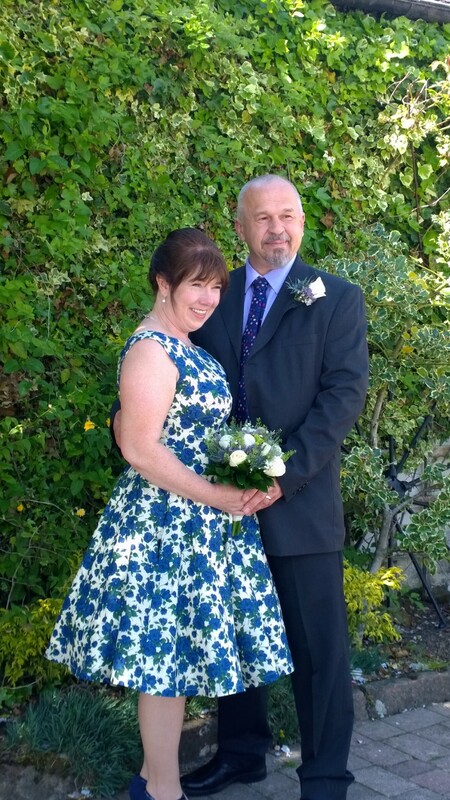 So, as you’ve probably guessed by the title, I got married! It’s taken 23 years and a 13 year engagement but we got there in the end. 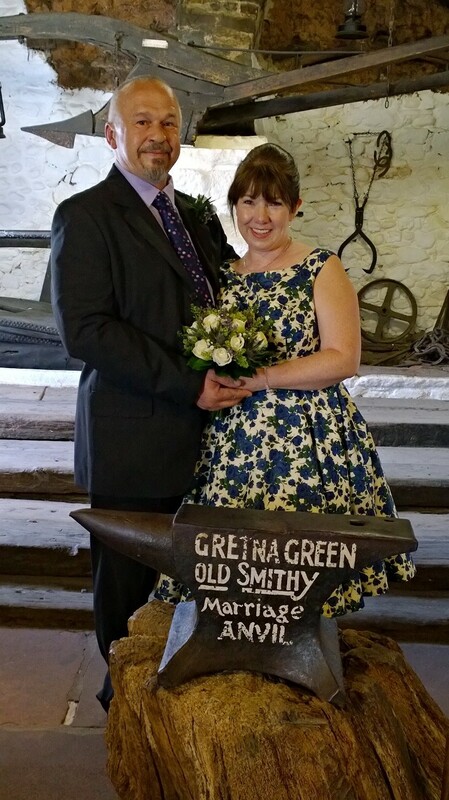 I never wanted a big do (probably why we left it so long) so we decided to do the slightly cheesy thing and elope to Gretna Green. Of course the first thing I did after booking the date (31st May) was start planning the dress. 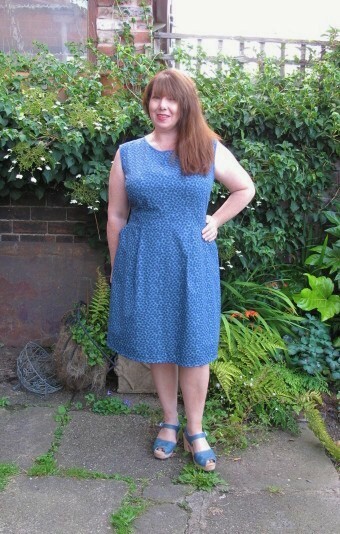 I’d been looking for an excuse to make a blue Liberty Carline dress since I made my Edith blouse (this was probably a factor in deciding to get married) but finding more proved difficult. My last piece was bought on eBay (I had an email notification and was quick to snap it up before someone else did) I couldn’t find any on Google and my hope began to fade. I tried an image search and after a couple of pages found a small, dark picture, clicking the link took me to Shauket, to my joy it was in stock and available online. I ordered four metres, just to be on the safe side. The end of May seemed a long way off, I thought I could wait until the end of March before starting work on it. I spent the winter looking for the right pattern but found it a struggle. 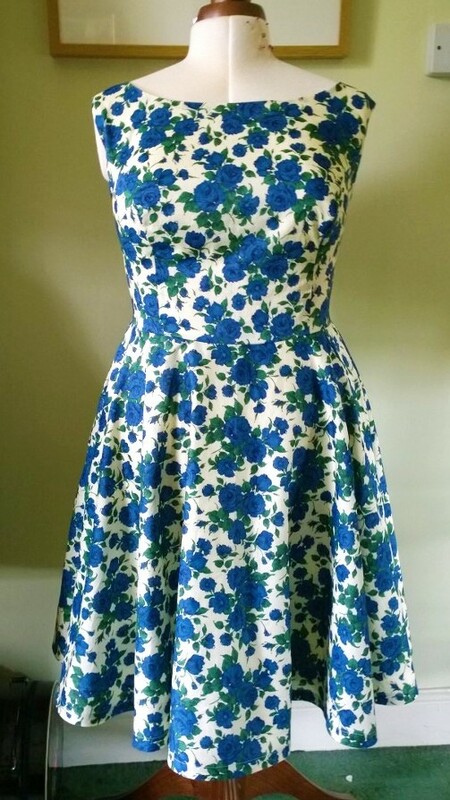 I knew I wanted something fit and flare (with a frou frou petticoat) but kept settling on a pattern only to change my mind a week later. Time quickly got around to the end of March and I still hadn’t made a decision. Any detail would be lost amongst the print so it needed to be simple, basically a boatneck princess seamed bodice with a full circle skirt. The lightbulb moment finally happened; I realised it was so simple I could draft it myself. I already had a princess seamed bodice block and just needed to add a circle skirt as a basic starting point. 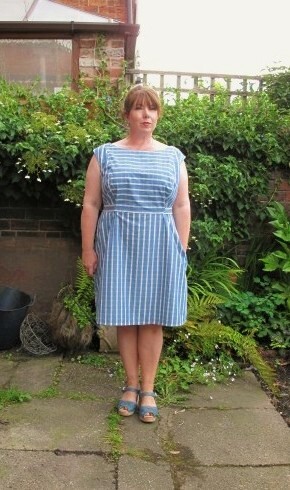 Determined to get the fit perfect I did a couple of muslins before sewing a whole dress rehearsal dress. 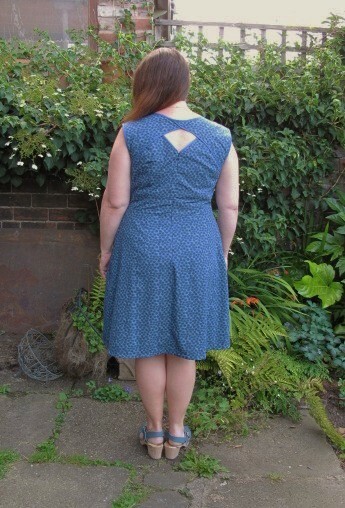 I initially tried a wide scooped back but because the front neckline was so wide it was slipping off my shoulders I ended up with wide boat neckline (the shoulders were resting right on the edge of my shoulders) and a V back which ended just above my bra band. By the time I was making my dress rehearsal dress it was halfway through May. Running out of time I put the zip in, checked it fitted then abandoned it to start on the real one (it still needs the back seam sewing up and hemming) I used a very soft lightweight cotton for the lining which was part of my winning bundle from Fabworks Millshop. 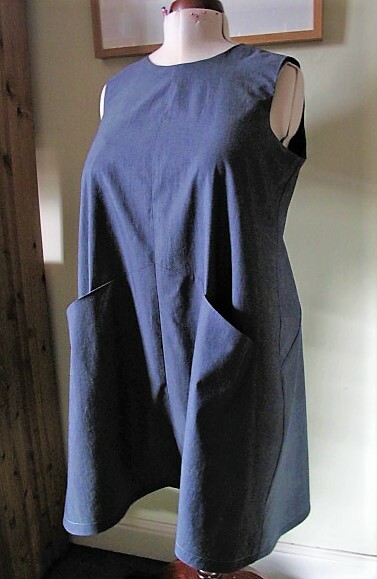 To give both fabrics a bit more body and make the sewing process easier I went to town with the spray starch which worked a treat. The good thing about lining dresses is that all the seams are hidden away so I cheated a bit and cut dress and lining out with pinking shears. Construction went really quickly. I bound the hem of the dress and lining with satin bias binding and also added in seam pockets! Initially we planned to keep it a secret, just run away and tell everyone after the event. I however let it slip one night after too many glasses of wine at our neighbourhood ‘book club’ (we spend five minutes talking about the book and the rest of the night drinking copiously and gossiping about the neighbours, in fact we haven’t had a set book for three months now!) It became more and more difficult to keep a secret so in the end we had to tell everyone but still managed to keep it a secret from the twelve year old! He just thought we were going to Scotland for a holiday and needed a shirt and tie for meals out at posh restaurants. We waited until we were at the hotel and let him open the box with the rings in. After a lot of initial puzzlement and OMGs he was thankfully pleased about the situation. 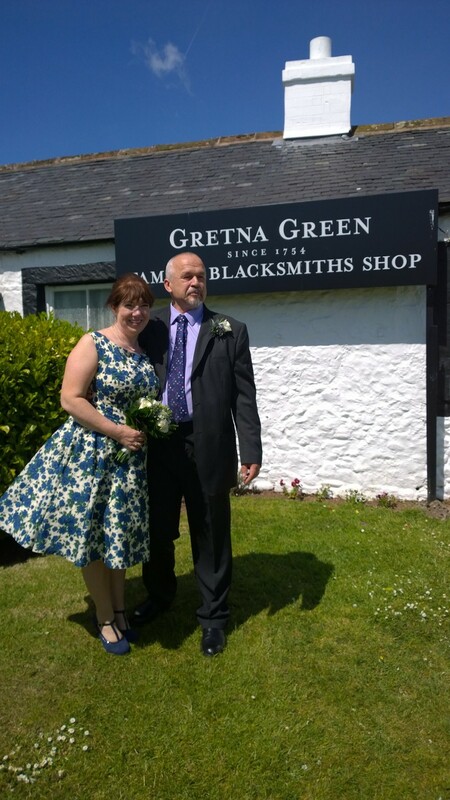 I’d imagined Gretna Green to be part of a town (the British equivalent of Las Vegas) but it stands alone in a tiny hamlet. It’s understandably a tourist attraction, there are shops and restaurants to cater for this but if anything it adds to its charm. The day itself couldn’t have been more perfect and the weather was glorious. We didn’t have our own witnesses so the Registrar disappeared and came back with two Australian tourists (Ann and Jessica, we’ve since been in touch.) 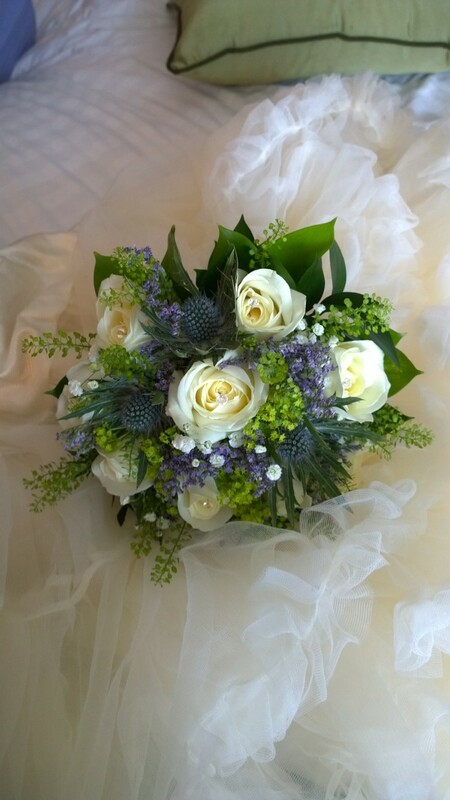 My Son gave me away as well as acting as best man, and we were led in and out by the resident Scottish Piper (Alan) The ceremony itself was very moving, full of happiness, interspersed with laughter and more than a little giggling. The pockets came in handy as I had somewhere to keep my tissue. As we got married the day after Whitsun bank holiday the place was quite busy. My Husband (still getting used to that) told me afterwards that there must have been fifty tourists taking pictures outside but I was completely oblivious. We’ve since got the proofs back from the photographer and I have the biggest grin on all of them. I enjoyed it so much I wanted to do it again. If anyone is looking to have a small scale wedding I’d highly recommend it! We had a few days in the Lake District for our honeymoon and again the weather was perfect. 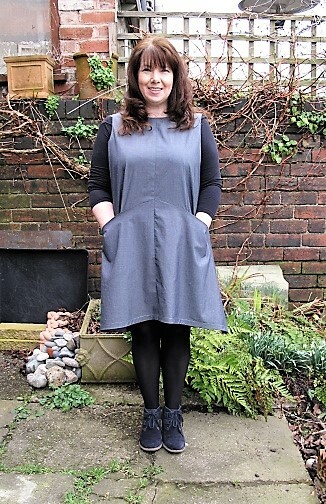 I’d packed boots, sweaters and waterproofs but ended up living in my Southport dress and Monetas. 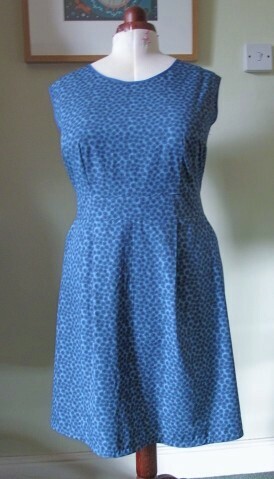 The main gap I noticed was a shortage of sleeveless dresses so I have three lined up, starting with the Grainline Alder. 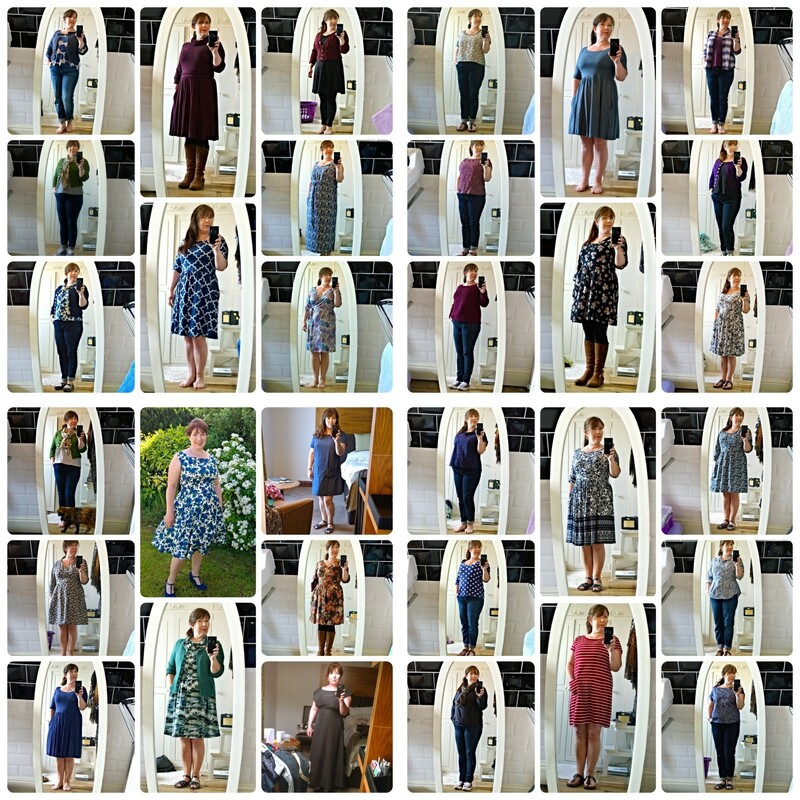 Since beginning this however the weather has been wet and horrible so I’m now wondering if sewing a winter dress will conversely bring the sunshine back.